Low Calorie Chocolate Milk Made With Almond Milk! Last month I spoke about how I've kept off 80 lbs, even 2 years later. I also gave 5 common sense tips that any like-minded person hoping to achieve the same results could follow. 2.Food cravings do lessen--but one needs to have a food substitute in place. So, 2 years ago I was "ready" to get healthy, but I needed food substitutes to take the place of chocolate bars and frequent snacking. I started off with drinkable yogurts, but I found that they were too high in sugars. Later, I found that with unsweetened almond milk, I could control the sugar level, and decide what went into a smoothie. One cup of unsweetened almond milk is only 30 calories. When I add to it 1/10th of a packet of hot chocolate powder, the drink becomes 42 calories only--and it also satisfies my craving for chocolate. Really, all I'm looking for is that little taste of chocolate, and I'm satisfied. It's also very tasty. 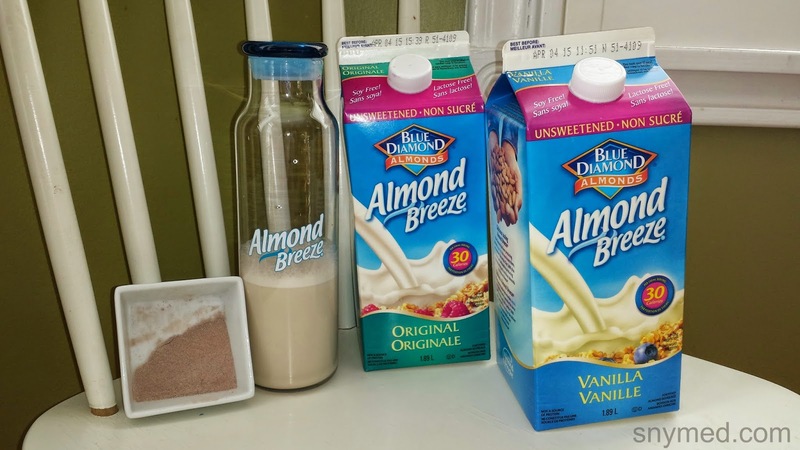 Did you know that Almond Breeze is now "cooler", with a new refrigerated product available in the same great flavours? New refrigerated offerings include Original (and Unsweetened Original), and Vanilla (and Unsweetened Vanilla). Almond Breeze beverages are available in both refrigerated and shelf stable sections at your local grocer. Visit the Almond Breeze Canada Website! What food or foods do you have a weakness for? Do you have any tips to stave off snack cravings? I love the idea of finding substitutes that my family enjoys. Almond milk is one of them, and we often use it in recipes. Congrats on your big weight transformation! Great idea to mix in the hot chocolate powder, is that less calories than the chocolate Almond Breeze? Mom Vs. The Boys, depending on how much cocoa powder and sugar that one adds, you can definitely make a lower calorie version of the chocolate Almond Breeze. The version I make has much less sugar. Great idea to use unsweetened almond milk to make chocolate milk. I definitely have a weakness for chocolate. I will have to try this. I hadn't thought of this for a chocolate milk substitute. I love chocolate and want to lose some weight. This substitution will be helpful. Thanks. Over the last few years, I removed dairy out of my diet and only have Almond Fresh in my fridge. Love it! Thanks for the tip, I am doing well but I am struggling with food cravings right now and I really don't want to backslide, totally going to try this out!